I like my ice cream. Especially on top of pancakes with some fruit on the side. And that is just for breakfast. 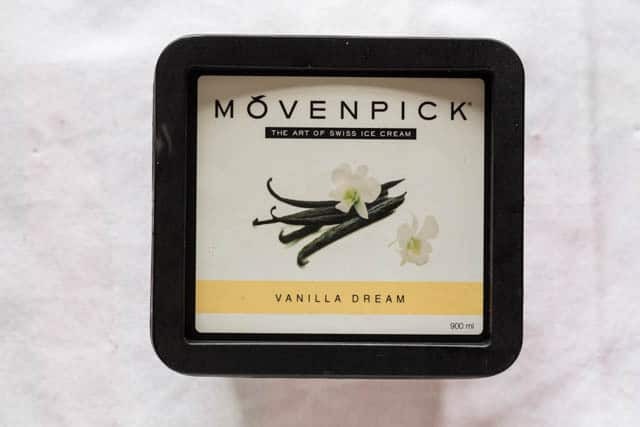 So of course I would not say no to creating a sundae for Mövenpick ice cream. Especially handy as I had been thinking of recreating one of my Sierra Leonean sundaes for my girly weekend. 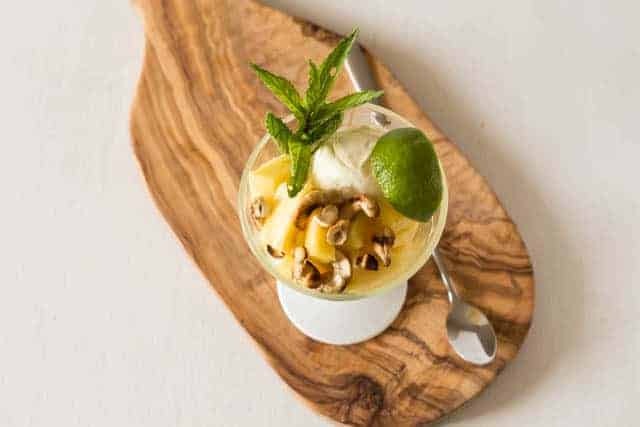 After browsing through Mövenpick’s range, I saw their luxury vanilla dream ice cream which I knew would be perfect for my Bintu Special – aka cashew, lime and pineapple sundae. Back home this sundae always started at a very basic level ie picking the cashew apple (from the solitary cashew tree we had). Then I got to eat the fruit, before carefully peeling of the toxic shell and roasting the nut. As fun and exciting as that was, I am glad that now I can just get myself a pack of already peeled cashew nuts to use – there is a lot to be said for convenience. On the other hand I miss the pineapples in Sierra Leone – they would suddenly appear in the market as the season came. And there would be pineapple sellers, with ready-peeled slices on their heads, which you’d just be able to lean out of the car, hand over a some cash and have some sweet, warm, fresh pineapple. This sundae is good. 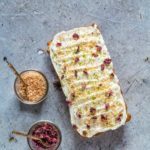 Try to get your pineapple as ripe as possible so that the sweet flavour really contrasts with the lime flavour and complements the slightly sweet roasted cashew. 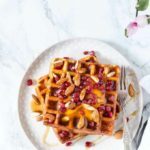 This is fresh and simple and without any syrup, relying entirely on the sweetness of the pineapple. I like to think that is a healthier sundae, at least that is what I tell myself. It really works. Next on my list is a sundae which involves the Mövenpick lemon and lime ice cream. 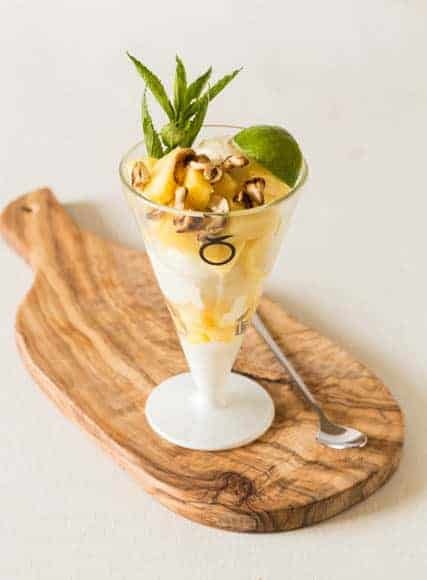 See more sundae recipes with Mövenpick ice cream. Coffee walnut banana ice cream Sundae from London Unattached. Chocolate sundae royale from Chocolate Log Blog. White chocolate hot berry sauce ice cream sundae from Fuss Free Flavours. White chocolate ice cream sundae with a summer berry fudge sauce from Lavender and Lovage. 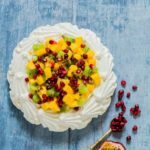 Thanks to Mövenpick for providing me with supermarket vouchers and sundae glasses to create this recipe for their blogger challenge. The winner will get a 2 hour master class with Cherish Finden from the Langham as well as afternoon tea for two at the Palm Court. 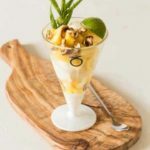 Don't forget to tag #recipesfromapantry on Instagram or Twitter if you try Cashew, Lime and Pineapple Sundae - Sierra Leone Flavours! 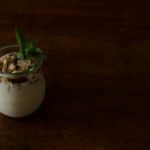 It is really, really awesome for me when you make one of my recipes and I'd love to see it. You can also share it on my Facebook page. Please pin this recipe to Pinterest too! Thank you for reading Recipes from a Pantry. And just absolutely great for this weather rigth? Your photo quality is amazing! Thanks Mez. I think the ice cream helped a lot 😀 . Nettie, Movenpick will be pleased to hear that. As am I. This is perfect for summer, I love pineapple! Familyfever – glad to meet fellow pineapple lovers. I hope you get to make this. I think I am going to have to send you a picture GG. Mouthwatering, just mouthwatering. As a sidenote, what does a cashew apple taste like? Soft, fleshy and sweet. I don’t know if that makes sense Emma. What a lovely sundae Bintu, with all those fabulous flavours of Sierra Leone. And a truly beautiful picture too! aww thank you for linking up to mine! I’ve never made a sundae before, so it was err, what you’d call experimental. I’d love to go to Sierre Leone one Day…and try some Bintu flavours in situ! It looked really good Fiona. The right sort of experiment. I hope you get to go to Sierra Leone too. isnt this just so perfect for summer.. look seriously delicious. i could definitely kick back with one of these right about now! Glad to be tempting you Thalia. Experimenting with ice cream is kind of the perfect job right? 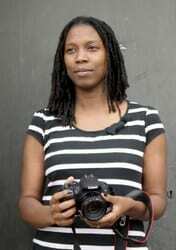 Now, that is a combination Bintu! Sounds like something I would want to try…. I am pleased that so many people are inspired to try this. Movenpick and my job is done. This sounds such a refreshing and tangy flavour combo, love making a subdae reminds me of childhood. Oh wow this looks amazing! Your photography is so beautiful too! i am loving these flavors! thanks for a great idea! Mike – ice cream on pancakes is soooooo good. Seriously you need to have test it. Wonderfully simple, exotic and absolutely the sort of thing I want a large spoon for! lovely use of cashews, I don’t normally do that. Large virtual spoonful sent over to you Deena. This looks absolutely stunning Bintu and lovely fresh flavours for the summer too. Lovely combination of flavours and photo Bintu. Ice cream is possibly the hardest thing to photograph! Ice cream def one of the challenging things to photograph as a food blogger. GREAT combination of flavours here Bintu!LOVE it! It is Alison,the lime certainly makes it so. Sounds like a great recipe Bintu, good luck with the competition. That sounds absolutely fantastic – my favourite flavours in one glass – delicious! I have always wanted to taste cashew fruit – have you found anywhere in the UK where it can be bought?